Sponsored bike ride around Lincolnshire's churches. Sponsor Ruth and Jim Eagle, or have a go yourself. Contact Ruth and Jim on 322285 if you would like to sponsor them or Liz Murray on 323357 if you would like to take part yourself. Half the money raised goes to a church of your choice (it doesn't have to be All Saints Nocton, but we'd like it to be!) and the other half to the Lincolnshire Churches Trust. Nocton Church will be open for Heritage Open Days from 10 a.m. to 4 p.m. on Saturday 8th September, and from 12 noon to 4 p.m. on Sunday 9th September. Light lunches and refreshments will be on sale for the church repair fund. Service in Church at 4pm followed by the Harvest Supper at the village Hall. Tickets £10 for adults, £5 for under 12s. A delicious supper and a glass of wine / fruit juice. For tickets please contact Ann 322739, Doreen 322323 or Carol 322930. 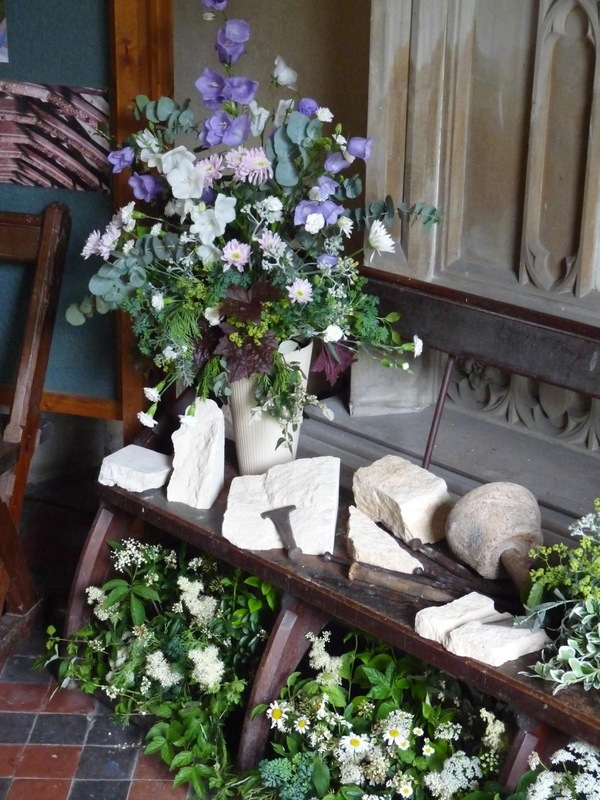 The best thing about the All Saints Church Flower Festival was that so many people in Nocton and Potterhanworth got involved. 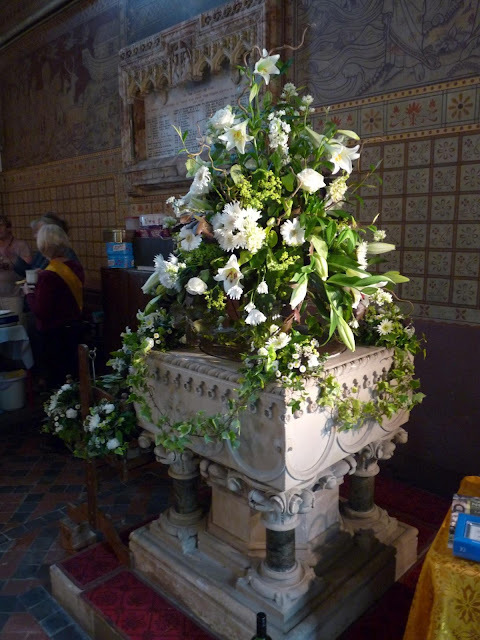 Whether it was growing plants and selling them, arranging flowers, doing the Preview catering, baking cakes and refreshments and serving them, stewarding, making a donation towards the flowers or the wine, doing a reading at the Songs of Praise – the age range was from 4 and upwards. The second best thing was that the week-end of 29 June to 1 July was fairly sunny with just a few showers. 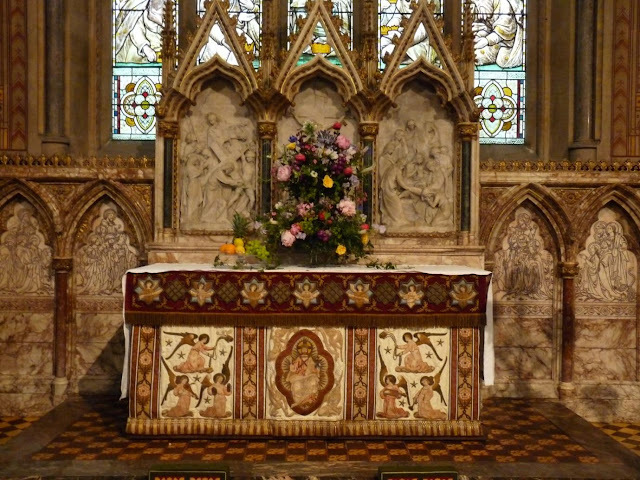 The worst thing was that while the flowers were being arranged, the heavens opened up, and the south aisle roofs leaked like sieves. Out came the buckets and mops – reminders that although the main roofs have been renewed, the south aisle, vestry and memorial chapel roofs all still leak very badly. As Sheila Redshaw, one of the organisers of the plant stall said, you can keep patching up, but eventually, after 150 years, you just have to do things properly. The south roofs are for a later stage of repairs, but the week-end raised an impressive amount towards the target of £40,000 needed to pay for just the current repairs. Work has stopped on the chancel wall paintings, as they will cost over £20,000 to put right. Our beautiful church is high maintenance! The theme of ‘our village in 1862’ was just right to celebrate the church’s 150th anniversary. The flower arrangers had learned that there were no pedestal arrangements at the time of the church’s consecration, so other equipment came into use as flower stands: a milk churn for the farmers; a cradle for the children baptised at the font; logs for the game keeper’s window; Victorian plant stands to represent the cottage gardeners; and tiered stands, using cake stands one on top of the other, on the high altar and in the housewives’ display in the vestry. The miller, wheelwright, village shop, hall gardeners, the Vicar, stonemason and the Royal Ripon Lodge were all represented by the imaginative use of flowers and period objects. Nocton School did a lovely display on the theme of the Victorian school room. As well as their garden flower arrangements, the children’s own embroidery contrasted with the Victorian sampler made by a village child that hangs on the walls of Nocton School. Like the church, the school was the gift of just one family – the Earl and Countess of Ripon and their son, the Marquis of Ripon. We felt privileged to have with us during the week-end the Earl of Buckinghamshire. He represented the Countess’s family, the Hobarts, whose estate of Nocton and Dunston the Countess of Ripon inherited. Hermione, Aaron and Holly read an extract from Lark Rise to Candleford in the Songs of Praise on Sunday evening, which like the Flower Festival had the theme of our village in Victorian times. Afterwards, Hermione asked the Earl of Buckinghamshire for his autograph! The Lincoln Minster School Chamber Choir gave a concert on the Saturday evening in which the singing was quite amazing by any standard, especially considering that the performers were mostly aged 16 and under. The whole week-end was a rich mix of history, artistry, music and entertainment. It helped to put Nocton on the map with visitors from near and far. Our thanks go to all who helped to make this such a successful and enjoyable event. Click here for the Doodle July/August edition.